Mix interesting form with traditional window functionality by adding a radius window to your home. Great for front-facing windows to add charm and style, radius windows enhance home design while letting in natural light. In an 'arch' or 'radius' window, the bottom half of the window is rectangular while the top is an arch or half-circle. Arch shaped windows bring a softness to a room and juxtaposes the straight corners of rectangular windows and walls for a contrasting effect. 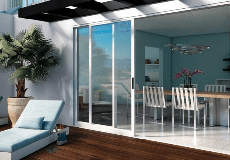 Arch and radius windows can be operable to let in fresh air or fixed to only let in light. A popular way to enhance the design of an arch window is adding grids. Grids are bars that divide the windows glass into smaller panes for aesthetics. Grids are available in exterior and interior options to better simulate real divided lights, while internal grids facilitate glass cleaning. Explore Milgard arch windows by product line or frame material below. NEW! Introducing the Essence Series® Radius Casement. Beautiful to look at - with little upkeep required, Ultra™ Series fiberglass windows are built to last.